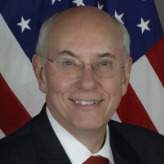 Born in Michigan, William John Garvelink served as US Ambassador to the Democratic Republic of the Congo from October 22, 2007, until May 2010. Garvelink received a BA in history from Calvin College, an institution of the Christian Reormed Church in Grand Rapids, Michigan, and an MA in history from the University of Minnesota. He also attended the University of North Carolina for post-graduate studies in Latin American history, but ran out of money before earning his Ph.D.
Garvelink worked for three years for Congressman Don Fraser (D-Minn) and was a staff member of the Subcommittee on International Organizations, Committee on Foreign Affairs, of the House of Representatives. In 1979 Garvelink joined the US Agency for International Development (USAID), During his USAID career, he served as the management auditor in the Office of the Inspector General, was assistant coordinator for African assistance, assistant program officer and the deputy program officer in Bolivia, deputy director of the Office of African Refugee Affairs, assistant director for disaster response, deputy director for the Office of Foreign Disaster Assistance, mission director of USAID/Eritrea, and senior deputy assistant administrator in the Bureau of Democracy, Conflict and Humanitarian Assistance.